To say I’m chuffed would be an understatement and it made me think about how far I’ve come on my Thinking Slimmer journey. With the London Marathon less than two weeks away I thought it would be good to review my progress towards my current Thinking Slimmer goals. Although the marathon itself is still 12 days away I know that I have trained well and done everything I could have done to put me in the best position to be able to complete the race on the day. I have never been concerned with how long it will take me, as a first timer this is all about completing the distance, enjoying the experience and finishing with a smile on my face. I know now from the training that I have done that I will definitely finish on the day, even if I have to crawl the last few miles. That’s an amazing feeling for someone who only started running around this time last year. This one gets a great big tick. I now have a couple of running tops and two pairs of running capris in a size 12. 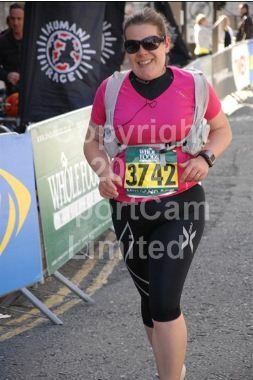 On the day I will be wearing a size 12 top underneath my charity running vest. 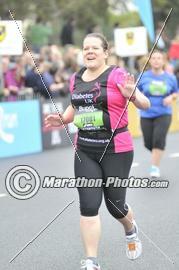 This one was taken back in October at the Great South Run. The scales haven’t moved but I am most definitely smaller!! Not all goals with Thinking Slimmer have to be weight related and this one isn’t. I have a charity place for the marathon and as part of that I have pledged to raise £1250 for a small East London charity that does community support work in the area that I live. Thanks to the generosity of family, friends and colleagues my current fundraising total stands at £1180. I am just £70 away from my target with several people who have promised to sponsor me still to donate. I am very confident that I will reach my target, so much so that I have raised my target by £250 and now hope to raise £1500 for what I think is a really worthwhile cause. 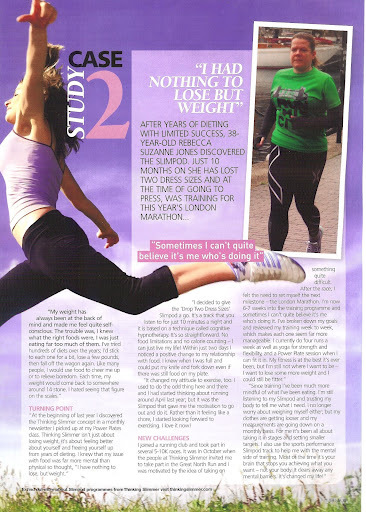 So, if you’re reading this and have a couple of spare pounds that you could donate to help me towards this new target then please visit http://www.justgiving.com/Rebecca-Jones12 and donate securely online. So I am on track to achieve all of my current goals by marathon day. I’ve already started to think about what comes next but that’s for another day. For now this is all about the next 12 days and getting to that start line, fundraising target met and in good shape ready to run the London Marathon 2012! Previous Week 16 – this week I have been mostly…..knackered! Stunning. Your are an amazing lady. You've worked so hardfor this. Well done. What will your new goals be? Thank you both. Dawn – I want to get faster at running so that's going to be one of my goals – I need to quantify by how much which is what I'm mulling over at the moment – what's realistic by when etc. Then there's a size 12 pink dress hanging in my wardrobe which I want to wear out on June 8th – going for a celebratory meal with a friend who is also running the marathon. Then I'm going for something a bit different – I want to be able to touch my toes with my legs straight! I can't do this as my hamstrings and calves are really tight so I want to work on that one. May be the toughest of them all! The pics for that one should be interesting! !